When people ask me to sum up what I write about, I often respond “Prehistoric creatures with big, scary teeth.” That isn’t strictly true –- my interests are a bit wider than that – but I do have a fondness for sharp-toothed Jurassic theropods, sabercats, and other formidable carnivoresof ages past. (When a friend of mine recently extolled the virtues of the herbivorous hadrosaurs, I jokingly responded, “Of course they’re important –- tyrannosaurs had to eat something, after all.”) It goes without saying that teeth are just as crucial to herbivores and omnivores as to meat-eaters, but teeth can truly be amazing and terrifying things. Where teeth came from in the first place, though, has been an unresolved question. Some exceptional fossils from the Mackenzie Mountains of Canada may help solve the paleontological mystery. According to the traditional fossil lore that was handed down to me and my fellow students from grade school through college, teeth got their start as fish scales. Think of the tiny, hydrodynamic scales which cover a shark’s body –- these bits of sharp body armor could have been readily modified into larger, specialized structures around the mouth to create the first teeth. The story was really quite simple. Proto-sharks or other archaic jawed fish had scales of variable size around their mouths, and these scales provided an advantage in catching or processing prey. Over time, the pressures of natural selection favored larger scales in at least one lineage and thereby the earliest teeth were formed. 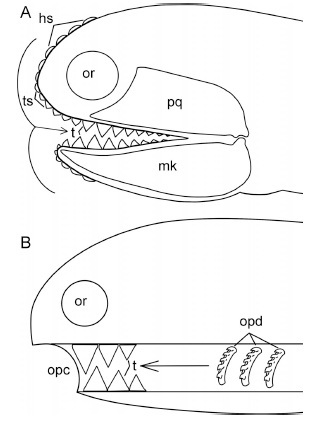 Slightly modified scales around the mouths of early fish and the anatomy of shark scales have been cited as evidence for this view. We all know what the late Stephen Jay Gould would say about classic textbook stories. (Read his essay “The Case of the Creeping Fox Terrier Clone” in Bully for Brontosaurus if you haven’t already.) Hypotheses and “just-so stories” are often passed down from edition to edition without the inclusion of new ideas or evidence. In the case of how teeth got their start, I had no idea there was an alternative hypothesis until long after my Paleontology 101 course at Rutgers University. The classic scale-to-tooth scenario is known as the “outside-in” hypothesis among experts on early vertebrates. Frustratingly, though, no unequivocal transitional scales documenting this change could be found. If the outside-in hypothesis were accurate, then at least some fossil fish would exhibit unequivocal transitional features. An alternative –- the “inside-out” hypothesis -– visualizes teeth as coming from a similar source but in a very different place. According to this notion, teeth are modified scales which once existed along the gill region inside the mouths of early fish. These structures may have been co-opted to form teeth through tweaks in early development, and the resulting proto-teeth might have been present in jawless fishes as well as jawed ones. The problem is that we can’t directly study the development or genetics of these early fossil fishes to test this idea in detail. Finding physical, intermediate structures in the fossil record itself is key. Two hypotheses of tooth origins. A represents the outside-in hypothesis in which scales around the mouth were co-opted to become teeth. 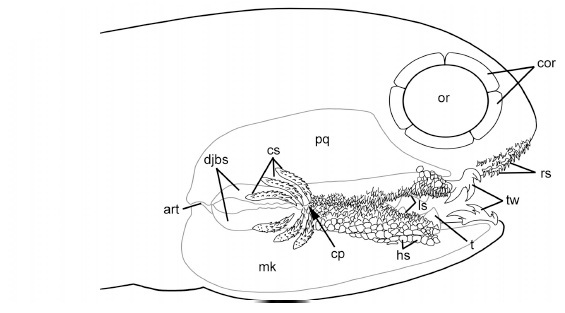 The second, seen in B, suggests that teeth started as internal gill scales. From Blais et al., 2011. Both hypotheses are based on the co-option of pre-existing structures into teeth. Based upon a recently-published Journal of Vertebrate Paleontology paper by paleontologists Stephanie Blais, Lindsay MacKenzie, and Mark Wilson, the long-lost fish exhibiting transitional features between scales and teeth may have finally been found. If the researchers are correct, teeth got their start on the outside. Located in northwestern Canada, the Man on the Hill fossil locality contains the vestiges of a roughly 410-million-year-old seabed. This was from a time when archaic fish teemed in the seas, but there were not yet any vertebrates on land. Among the fossils found here are acanthodians -– the so-called “spiny sharks” which are thought to be the oldest vertebrates to possess true teeth –- and what Blais and colleagues consider to be a chondrichthyan, or an early member of the group of cartilaginous fish which includes sharks, skates, and rays today. (According to the paper, the acanthodians have not been named yet but the chondrichthyan has been previously described as Obtusacanthus corroconis.) What makes some of these fish from this locality special is that they appear to have prominent, toothlike scales surrounding their mouths. The fine preservation of the fish from the Man on the Hill site shows the presence of many different types of scales and toothlike structures. Among the structures most similar to true teeth in the acanthodians are cheek scales -– multi-cusped scales on the outside of the mouth that looked like the tooth whorls set in the jaw. Their only apparent differences to true teeth are position and size, and the scales of the fish become less toothlike as distance increases from the head. As for the toothless Obtusacanthus, the fish had a series of modified head and lip scales which pointed toward the mouth and may be transitional scale types. These observations, Blais and co-authors conclude, indicate that scales in proximity to the mouth were modified by some developmental process to become toothlike. Teeth originated from exterior scales, and the same processes that created teeth continued to influence the shape of scales around the mouths of ancient fishes. A line-drawing of a generalized acanthodian from the Man on the Hill site. Abbreviations: art, articulation of the jaw cartilages; cor, circumorbital bone; cp, convergence point; cs, cheek scale; djbs, dentigerous jaw bones; hs, head scale; ls, lip scale; mk, Meckel’s cartilage; or, orbit; ot, otic material; pq, palatoquadrate cartilage; pst, phosphatized tendon; rs, rostral scale; t, tooth; tw, tooth whorl. From Blais et al., 2011. None of the fish considered in the new study were ancestral to the first vertebrates with teeth. As seen in the acanthodians from the site, teeth had already developed within some groups of jawed fish. The first fish with teeth must have been a more ancient creature. Nevertheless, the fish from the Man on the Hill site are important in that they preserve archaic characteristics related to the development of teeth. The acanthodians and Obtusacanthus possess transitional features consistent with the idea that teeth started as modified exterior scales, and as a result these forms provide paleontologists with a search image as they search for even older evidence of tooth origins. This is what evolution teaches us to expect -– a kind of ongoing tinkering in which some old characteristics are preserved alongside more recently developed ones. Every species is a mix of the archaic and the novel. As the researchers themselves note at the end of the paper, though, this new evidence does not rule out the competing inside-out hypothesis. The toothlike scales of the acanthodians and Obtusacanthus are consistent with an outside-in scenario for tooth origins, but, as ever, additional evidence is required to be sure. Perhaps aspects of both might turn out to be accurate –- maybe the forerunners of our own teeth started off as external scales, while jawless fish and other archaic forms independently evolved different sorts of teeth from gill scales. After all, what were thought to be simple and straightforward evolutionary scenarios often become increasingly complicated as our interrogation of the fossil record continues. There are more weird and wonderful things in life’s history than dreamt of in our current understanding. 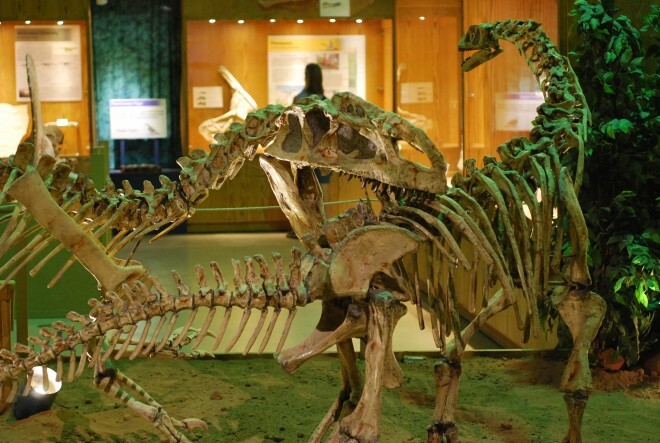 Top Image: Teeth at work — a Monolophosaurus bites into a Bellusaurus at the Wyoming Dinosaur Center in Thermopolis, Wyoming. Photo by the author.